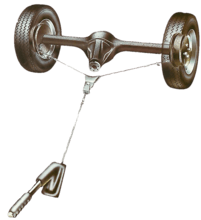 Most cars are still fitted with drums on the back wheels with the handbrake operating directly on the brake shoes by a simple mechanical linkage. 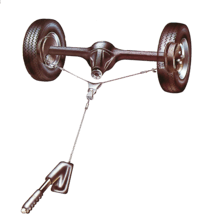 The most common handbrake layout used on a four-wheel disc brake system has a small auxiliary drum brake mounted inside the brake disc. A pair of brake shoes, much the same as those in a normal rear drum brake, are moved outwards by the operation of the handbrake lever. They press against a 'drum' formed by the inner surface of the centre of the brake disc. The shoes are fitted with a star wheel adjuster to compensate for wear. Once this adjuster has been used, the handbrake cable adjuster can be used to take up any remaining slack. High-quality, high-performance cars, however, often have disc brakes on the rear as well as the front wheels. With all-round disc brakes, it is very difficult to operate the rear brake pads by a mechanical linkage from the handbrake. So some manufacturers have come up with a different handbrake mechanism. The most common type of disc handbrake mechanism is fitted to cars such as the pre-Fiat Lancias, Jaguars, Porsches, BMWs and Volvos. This type of handbrake consists of separate brake shoes, not pads, and works like a normal drum brake except that the drum is formed by the inner surface of the centre of the brake disc. The brake shoes are fitted with friction material just like a normal brake shoe, so they wear out over a period and need renewing. Fitting new shoes is covered in another Mechanics sheet. If you find the handbrake cable is still stiff even after you've lubricated and adjusted it, then the chances are that it is seized or damaged inside its outer sheath. The only solution is to fit a new handbrake cable. Don't leave it for long — if the cable sticks even slightly on, the handbrake shoes will rub on the drum face and wear down very rapidly. If you are having problems with the handbrake, the first job is to check that the cable has not become frayed, seized or detached underneath the car. Jack up the rear of the car and place it safely on axle stands. Follow the cable back from the handbrake lever, looking for signs of damage. Get a friend to operate the hand-brake while you watch for any lost movement. If any operating levers appear to be stiff, squirt the pivot points with penetrating oil. Examine each brake shoe for wear. If the shoes are not too worn, adjust them with the star wheel adjuster. Rotate the brake disc and look through the adjustment slot to check each brake shoe in turn. If there is enough lining left, use a screwdriver to turn the star wheel adjuster until the wheel is locked. Back off the adjuster half a turn. To adjust the cable, use the adjuster nut at the U-shaped yoke or on the primary cable or rod. ... or at the primary cable or rod. Having established that the cable is in good condition, you should next check the adjustment. It is best to consider handbrake adjustment on an all-disc system in two parts. First you have to adjust the brake mechanism itself and second you adjust the handbrake cable. Find the handbrake cable adjuster and slacken it right off. Make sure that the cable seats properly where it passes through the backplate of the brake mechanism. Then find the adjustment access slot, which is on the perimeter of the brake drum part of the disc assembly. It may have a blanking plug in it. Turn the brake disc so that you can view the handbrake shoes there should be at least '/gain (2mm) of lining material left. Assuming the shoes are all right, look for the star wheel adjuster. This is usually fitted at the six o'clock position. Give the star wheel adjuster and its surrounding area a squirt of penetrating oil so that it moves more easily. Turn the star wheel adjuster with a short heavy screwdriver by resting the screwdriver on the edge of the slot and levering against the arms of the star wheel. Turn the wheel until the rear disc is locked in position and you cannot move it by hand. Then slacken off the star wheel by half a turn - you can judge this roughly by counting off four arms. Adjust the other side in the same way. The adjustment slot, through which you check the handbrake shoe linings and turn the star wheel adjuster, may be sealed by a blanking plug. This is usually made of rubber or plastic and can be readily prised out with a screwdriver. In most cases the cable adjuster is under the car and is the same as that on a typical drum handbrake. The most common has the adjuster located at a U-shaped yoke. To adjust the cable, slacken off the locknut and run the adjuster itself along the thread in the direction required to slacken or tighten the cable. Then pull the handbrake on two or three clicks, and the handbrake should lock the rear discs.